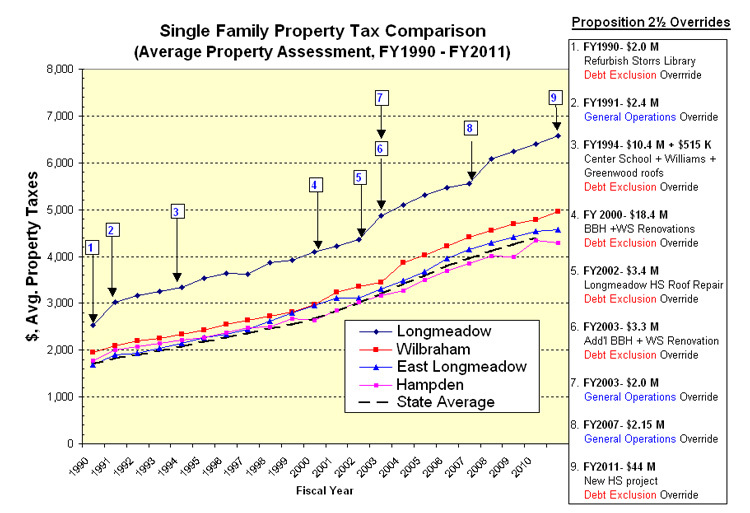 Below is a chart showing average property taxes for Longmeadow homeowners as compared to three other surrounding towns (Wilbraham, East Longmeadow and Hampden) as well as the state average from FY1990 --> FY 2011. The majority of year-to-year increases during the past 22 years in Longmeadow have been greater than the Proposition 2½ guideline of 2.5% (see Table I below). 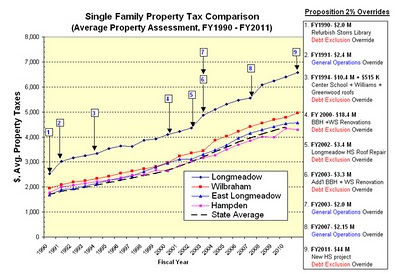 Over the past 22 years, Longmeadow average property taxes have increased at an average annual compound rate of ~ 4.5%- well in excess of the Proposition 2½ guideline. This difference is a result of the eight Proposition 2½ overrides (3 operational + 5 debt exclusion overrides) which have occurred during this time frame. 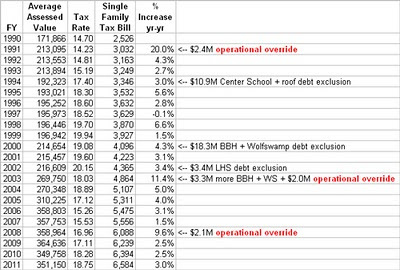 Given the current economic environment and the recent voter debt exclusion override approval for the new high school project, it is likely that Longmeadow property taxes are going to continue to increase at a rate significantly greater than 2.5%. It is also interesting to note the large difference in average homeowner property taxes between Longmeadow and three other towns in the surrounding area. Longmeadow property taxes for FY2011 are 39% higher than the average taxes for Hampden, East Longmeadow and Wilbraham which is very close to the historical average over the past 22 years. Come back to read Part II- Longmeadow Taxes which will show estimated future property tax increases that will result from the new high school project. At the SB meeting last November 1 Rob Aseltine announced that the Town Manager's Website Task Force had decided to use the WordPress "open source" Content Management System (CMS) platform for the town's revamped website. He also announced that the new Longmeadow.org website would be at least partially operational by January 1 with some additional components being rolled out at a later date. At the SB meeting on February 7, he announced a 2-3 month delay because more time was needed to transfer the archived meeting minutes to the new website format. 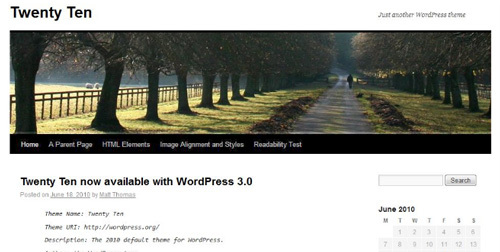 After a little Google searching (I simply searched for "Longmeadow + fiscal year + 2011"- click here to view results) I was able to find the new Longmeadow.org website and was surprised to see a masthead almost identical to the WordPress theme shown above. I'm sure that there are creative people in Longmeadow who can provide a more imaginative masthead for the new improved Longmeadow website and which would be more reflective of our town. Perhaps the Select Board should sponsor a contest! Mr. Barkett had it right... we don't need "analysis-paralysis".... we need a functioning town website with updated information. It shouldn't be that difficult! 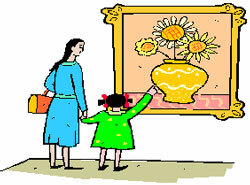 Have you visited the Springfield Museums lately? Have you ever visited? Just a few miles away is a gem in our Pioneer Valley. The five-museum complex located behind the Springfield Public Library is on Edwards Street in Springfield. All too often when a place of interest is located nearby, we do not take the time to learn more and visit. The five museums contain a wealth of History, Science, Art and definitely knowledge. School groups in Southern New England visit on Field Trips and learn about specific topics while taking Docent led tours. This week the Springfield Museums' talented staff has created a wonderful program, "Rockin' Reptiles Week" designed for children. Vacation Week Schedule. "Robots: The Interactive Exhibition" and Reptiles: The Beautiful and the Deadly" are special exhibits now on view (fee not included with General Admission). The Dr. Seuss (Theodor Seuss Geisel) birthday celebration with special activities will be on Saturday, March 5. Have you viewed the Chinese Jade Burial Suit? Learned about a Samurai's suit of armor? Admired the permanent collection of Currier & Ives prints? The Rolls Royce? Monet's "Haystack"? These are only a few of the beautiful objects on display in addition to the very large murals that depict life long ago in the Wood Museum of Springfield History. Visit their website, Like them on Facebook or Follow them on Twitter to learn about weekly events. School vacation week is a wonderful opportunity to visit this gem in our Pioneer Valley.